“Roy has created an immersive world of scents and sounds—we feel the corrugated steel roofs under paws, learn the best places to stay dry in a monsoon. The sleek queens, brawling toms and tail-chasing kittens live by a feline moral code, and you can feel their claws unsheath at the thought of the human world plotting their destruction. 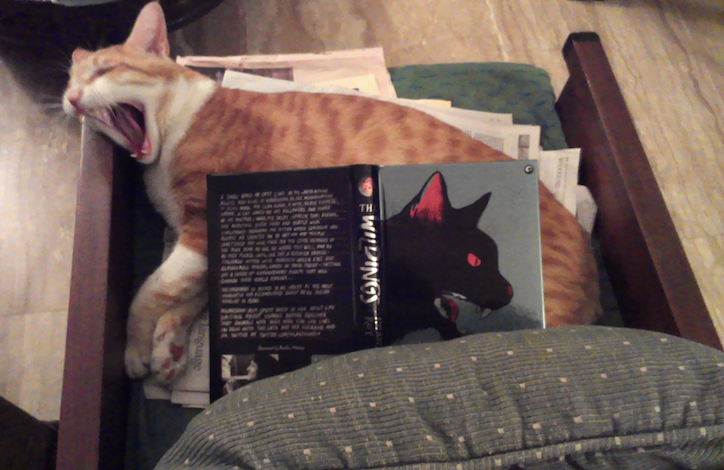 “The Wildings is an epic tale of cats. It’s a fantasy written by a person who loves cats, and has observed them quite closely. She invites you to empathise with her characters. Best known amongst littérateurs for her blogging, Nilanjana Roy seems an unlikely candidate to wrest the mantle of cat-based artistic accomplishment from YouTube. With The Wildings she has scored one for books. A prolific columnist and editor but a first-time author, Roy has given us a hair-raising read that wears its print proudly: an entrancing fable in the tradition of The Rats of N.I.M.H. and Watership Down. Somehow, I knew that Beraal was going to make an impact on me. A feisty young queen, she oozed charm, grandeur and strength. And tis a cat we talk about! Wildly engaging and foxy, “The Wildings” by Nilanjana Roy. She’s named the book rightly so and has created a band of characters with such mystique, you immediately become attached. I have said it before and I will say it again: If you love cats or animals or own cats or pets, then, “The Wildings” by Nilanjana Roy will be a perfect read for you. Even if you don’t own pets, it will. From professional photographer Naina Redhu, a book review in pictures. Peraltro nello stile denso della Roy il ritmo è proprio quello ideale per apprendere perché arriva un poco alla volta, sbuca fuori dalle pieghe, fa le fusa e si manifesta con miagolii inequivocabili. Queste sono solo alcune delle belle frasi che ho trovato nel libro. Tutta la storia mi è piaciuta molto e se amate i gatti ve lo consiglio caldamente, magari per festeggiare con loro. Una lettura piacevole e rilassante che in molti punti fa emozionare davvero molto. Si potrebbe pensare che l’autrice abbia deciso di guardare il mondo attraverso gli occhi lucenti dei felini per promuovere fermamente il diritto alla libertà; il gatto, infatti, non concede facilmente il suo sguardo e, sebbene possa acconsentire di diventare nostro amico, mai accetterà di essere nostro schiavo. «Se si potesse incrociare un uomo con un gatto», diceva Mark Twain, «l’essere umano ne risulterebbe migliorato, ma il gatto peggiorato». Il gatto, con o senza stivali, è stato spesso protagonista, sin dai tempi più antichi, di storie e favole: è astuto, veloce nell’azione, capace di sfruttare ogni situazione per portare a buon fine il proprio obiettivo, senza mai venire a patti troppo stretti con gli umani e senza mai perdere la propria identità felina. Los indómitos es otra sorpresa más para mis sentidos. Es original, imaginativo, plasma los animales salvajes y reales, con necesidades y objetivos, con maldad y bondad, pero también es una exquisita plasmación del mundo animal, de la cultura india y, en esencia, de la vida felina. Si adoráis los felinos, os hará estremecer, ¿pero sino? pues también. El libro es precioso y ya no solo por la historia, sino por las bellísimas ilustraciones que acompañan al texto. En ellas podemos reconocer a nuestros protagonistas y algunas escenas que acontecen a lo largo de la narración. Es un libro que os recomendaría, tanto si sois amantes de los gatos como si no, porque su historia está muy bien elaborada y resulta una lectura diferente e interesante. Denn Katzen und Clans…… es klang so sehr nach meinen (immer wieder gern gelesenen) Warrior Cats……… ich war also sehr skeptisch. Doch ich kann nur sagen: da lag ich ABSOLUT falsch. Denn “Der Clan der Wildkatzen” ist eine völlig eigene Geschichte – und zwar eine wirklich toll erzählte. Ich fand die Welt der “Wildkatzen” sehr “lebendig” geschildert und sehr liebevoll detailliert noch dazu. Die Figuren haben “Herz und Seele” und man kann sie richtig vor sich sehen. Die kleine Katze Mara zum Beispiel wird so liebevoll detailliert und lebendig beschrieben, das man regelrecht das Gehüpfe und Gehopse des Katzenbabies vor sich sieht. Die Autorin zeichnet uns mit diesem Buch ein spannendes Katzenabenteuer mit einer lockeren Rangstruktur, einem Grundverständnis um Gebiete und Regeln unter den Katzen und den Irrwegen der Katzenkultur. Auch lernen wir, das alle Tiere sich untereinander verständigen können und auf eine Grundsprache aufbauen. Das Leben wird von Regeln und Pflichten bestimmt und Harmonisiert somit. Eine Störung in diesem Gefüge kann nicht geduldet werden. Ein Buch das ich persönlich nicht aus der Hand legen konnte und durch seine Einfachheit überzeugt.